Prime Minister Narendra Modi is scheduled to deliver the valedictory speech to conclude the two-day national executive meeting in New Delhi today. The BJP on Sunday passed a resolution reaffirming the party’s commitment to build “New India” by 2022, and said the opposition has neither a leader nor a policy while Prime Minister Narendra Modi is the most popular leader in the country. The political resolution, praising PM Modi’s vision 2022, was presented by Home Minister Rajnath Singh at the ongoing national executive meet of the Bharatiya Janata Party. The resolution also discussed “new India” and a country free of poverty to ensure no one is shelterless. The BJP said the opposition’s plan to defeat the saffron party was a “day dream”. “This government has vision, passion and imagination, and the works of this government can be seen. By 2022, India will be free of terrorism, casteism, communalism and nobody will be homeless,” Javadekar said. 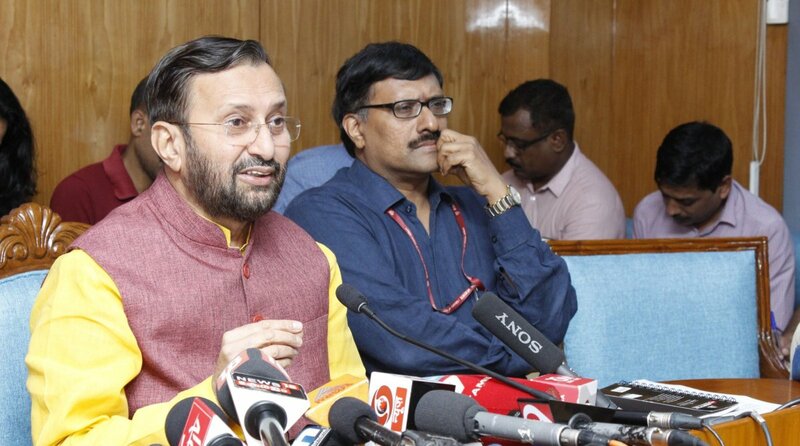 “The opposition is frustrated and it neither has leader nor policy; its sole agenda is to stop Prime Minister Narendra Modi,” Javadekar said. He said Modi was the most popular leader in the country and even after four years in power, Modi’s approval rating is more than 70 per cent. “BJP will return to power in 2019 with more seats than 2014. PM and Amit Shah are a unique combination. Today 19 states have BJP with over 350 MPs and 1500 MLAs,” he said. On Saturday, the first day of the meeting, party chief Amit Shah had slammed Opposition’s grand alliance and asserted that the “fragrance” of the BJP’s governance and the “charisma” of PM Modi would help the party return to power with an even bigger majority after the 2019 elections.